Fed up with promotional pens breaking all the time? Or the ink running out too soon? 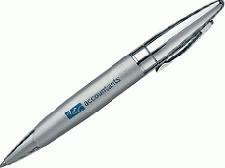 We have a solution, the Quality Promotional Pen with decent black documental ink, and a good pen mechanism leaves other stationery items standing still, and since its customisable with either screen print or engraved branding, its a brilliant business gift thats sure to last and is worth its weight in gold. Pens are a popular promotional freebie so its a good idea to step up the mark and provide a fitting solution that will outlive the rest! * Screen printing or both engraved and screen print available!